SIDNEY — Sidney City Council adopted an ordinance to rezone 12 parcels located on the east side of Main Avenue, north and south of Jefferson Street, held a public hearing for the rezoning of one parcel of land located on the south side of Dingman-Slagle Road, and heard information on the Property Assessed Clean Energy (PACE) program during Monday evening’s meeting. The ordinance for the request of Brian Winemiller to rezone the 12 parcels of land located on the east side of Main Avenue, north and south of Jefferson Street from a B-1, local business, to B-2, community business district passed by a slim 4 to 3 vote. The Winemillers requested the ordinance be tabled on Feb. 25 until they had a signed deal to purchase the property at 624 N. Main before moving forward when the property owner wanted to negotiate further. At the March 25 meeting, they asked council to un-table the item after securing a signed contract and said they were now working on repairs at the location. During Monday’s meeting, Mayor Mike Barhorst, Vice Mayor Mardie Milligan and Council member Janet Born voted “no” when the item came up for a vote. Barhorst and Milligan shared with the Sidney Daily News the same reason why they both voted no. Both separtely said they wanted to see development planning be put in place for that street and area prior to granting the rezoning request. “I believe in planning,”Barhorst said. He noted that the Winemillers will not always own the property and it his experience that if someone offers the right price, people will sell. Milligan said she wishes the Winemillers the best, but wanted to see the planning pieces put in place first. Born told the Sidney Daily News she was voting in accordance to what the area residents, not necessarily of Main Street, requested. She said neighbors were worried about a lot of trucks being outside of the business and it becoming an eyesore. “I want to listen to and do what makes our constituents happy. They asked me (to vote against the rezoning request) and that’s why I’m here,” Born said. The other rezoning request before council Monday brought forth a public hearing on Anna resident Mark Heitman’s request for the rezoning of the parcel of land located on the south side of Dingman-Slagle Road, west of East Ridge Boulevard in Sidney, from an R-1, single family residence to an R-3, multi-family residence district. The property is currently undeveloped. The Sidney Planning Commission voted at its March 18 meeting to the recommend for Sidney City Council to deny the approval of the rezoning request. Approximately 30 people attended the March Planning Commission public hearing and every area neighbor of the property in question spoke out in opposition to the rezone request. Many of the same residents returned to voice their opposition at Monday’s City Council meeting. Heitman did not attend Monday’s meeting. Milligan said she was not in favor of rezoning the area and that it would be highly unlikely for her to vote against the Planning Commission’s recommendation. Barhort agreed and said it would be highly unusual for any member of council to go against the Planning Commission’s recommendation. Rutledge Street resident Wes Branscum spoke first among several in attendance against the request. 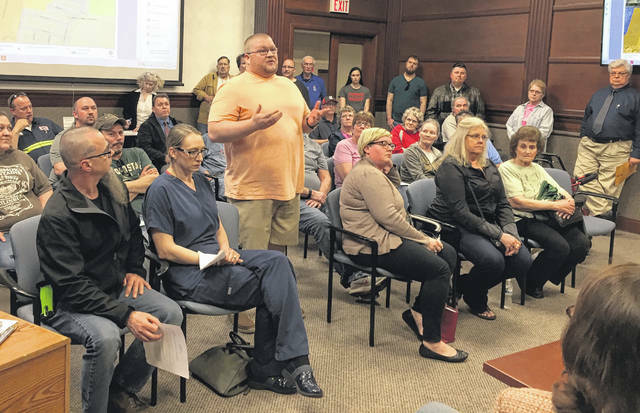 After several other residents of the area spoke against the request, Barhorst told the crowd the item will return to City Council for further consideration at the April 22 meeting. To clarify the process, he explained the request appears twice before council before it is voted on. In other business, council heard a presentation on the PACE program, a flexible financing tool to help commercial building owners pay for energy efficient building improvements with no money out of pocket. City Manager Mark Cundiff said PACE allows the building owner to pay for improvements as they reap the benefits of lower energy and maintenance bills. Payments for the improvements are collected through a voluntary municipal special assessment attached to the building, not the owner, and are paid back through the annual property tax bill for up to 30 years. Sidney would need to establish an Energy Special Improvement District (ESID), Cundiff said. Buildings located within the ESID would be eligible for the PACE Program. It is estimated the cost to draft the necessary legal documents to establish an ESID is $5,000. Most communities also contract with a third party administrator, but the costs will be charged to property owners which will cover the program costs and third-party administrator fees. Sidney-Shelby Economic Partnership (SSEP) Executive Director Jim Hill said he identified PACE as an economic development tool for Sidney and then introduced Caleb Bell with Bricker & Eckler Law Firm, an expert on the topic, to present the ESID concept and answer questions. • Adopted an ordinance to assess the cost of weed cutting or the removal of junk or litter for outstanding invoices through Feb. 20, which remain outstanding as of March 20. For junk removal violations, the invoiced amount is the actual cost of the junk removal plus 20 percent. A total of 28 properties will be assessed a total of $6,157 for junk removal and another property will be assessed $145 for weed cutting. • Was introduced to an ordinance to amend an ordinance regarding charges for excessive loads from industrial users, which are calculated every two years. The rates for years 2019-2021 for TSS/lb will decrease to $0.52 and for COD/lb will decrease to $0.188. • Adopted a resolution to authorize Cundiff to enter into a state of Ohio Community Housing Impact and Preservation (CHIP) program partnership agreement between the city of Sidney and Shelby County. The CHIP grant provides funding for a flexible, community-wide approach to improve affordable housing for low- and moderate-income. The program partnership agreement is necessary to ensure both parties understand their responsibilities and the allocation of funds. The grant application is due by May 3, 2019. • Adopted a resolution to authorize the submittal of a proposal with the Ohio Department of Transportation Division (ODOT) of Aviation for taxiway an estimated 95 percent of project improvements at the Sidney City Airport equaling $272,712.70. The project is for the rehabilitation of taxiway A at a total estimated cost of $287,066. The grant would reduce Sidney’s share of the project at an estimated $14,353.30. Council also resolved to cancel City Council’s July 1, 2019 workshop meeting. .
Cundiff reminded all that city offices will be closed in observation of Good Friday on April 19. Trash will not be delayed. Also on the courtsquare, the city’s annual egg hunt will be held on Saturday, April 20 at 11 a.m.